If you have an account manager who is simply supplying you with a spreadsheet of options, know that Broad Reach Benefits is different. Our main objective is to help you improve your company’s performance and protect your work force. Our client will agree, we’re not like other employee benefits advisors that they’ve worked with. Instead of meeting the status quo, Broad Reach Benefits has worked hard over the years to develop a completely different business model and relationship philosophy. If during your relationship we find that something needs and adjustment, you’ll know immediately. There are no surprises when working with Broad Reach Benefits. When it comes time to make budgeting and business decisions, our model of communication will make the process easier. Simply having an account manager provide a spreadsheet of options and some customer service doesn’t cut it today. That’s why Broad Reach Benefits is different. See the results of an independent consultant who surveyed a cross-section of our clients to find out how they felt about us. Our highly-experienced team of employee benefits advisors is dedicated to helping your organization control and lower employee benefit costs. We aim to take care of the needs and issues of your employees and their families while keeping your costs manageable. As an employee benefits advisory and brokerage firm for Tennessee organizations and businesses, we specialize in working with organizations that have between 30 and 500 benefit-eligible employees. Broad Reach benefits is an employee benefits advisory and brokerage firm that offers Tennessee businesses and organizations benefits products and services while helping them navigate the many challenges of the employee insurance industry. All while keeping costs manageable and while keeping employees and their families in mind. Whether your organization is focused on small business, medium sized business, manufacturing, technology, retail, finance, real estate, construction, services, or otherwise, we are dedicated to working closely with you in order to analyze your needs, set and meet employer/employee goals, and streamline the costs in a manner that protects business owners and employees. 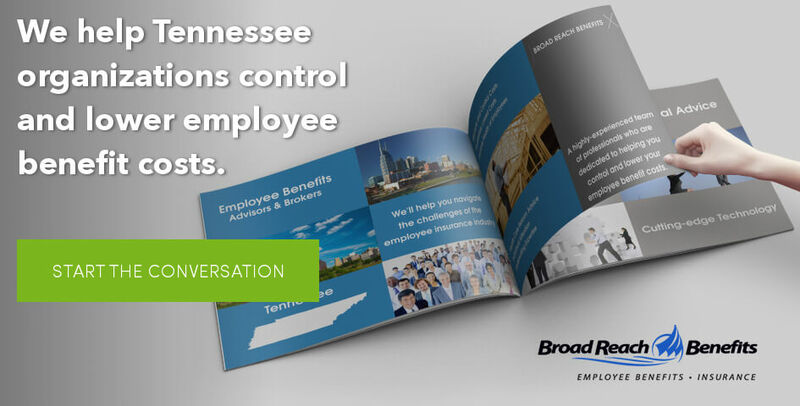 Contact us today for a free report on what other Tennessee employers look for in an employee benefits broker. The Broad Reach Benefits Difference- Individual attention, not institutional customer service that is transactional in nature. We’ll provide you with employee benefits consulting, actuarial and underwriting expertise, access to diversified domestic and international products, cutting-edge technology and shockingly fast customer service that will reduce the amount of time you spend administering your benefits and improve your company’s bottom-line performance.